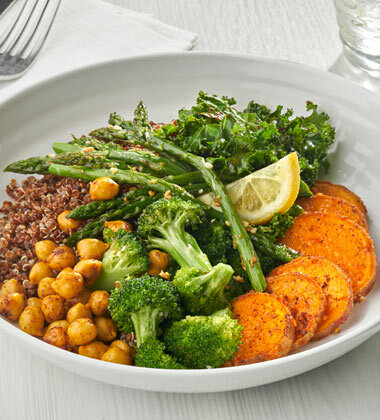 This fresh and hearty vegetarian dish is made with roasted chick peas, vegetables, and quinoa, cooked in a broth made with Campbell's® Signature Low Sodium Vegetarian Vegetable Culinary Foundation. 2. In a medium pot, add water and Campbell's® Signature Low Sodium Vegetarian Vegetable Culinary Foundation. Bring to a simmer. 3. Add quinoa and cook about 10 minutes or until soft on the sides and firm in the middle. Cover and hold until needed. 4. Toss the following together in separate mixing bowls. Bake on separate baking sheets. Mix broccoli, and the first measure of olive oil, and garlic. Bake for 10 minutes, or until golden brown. 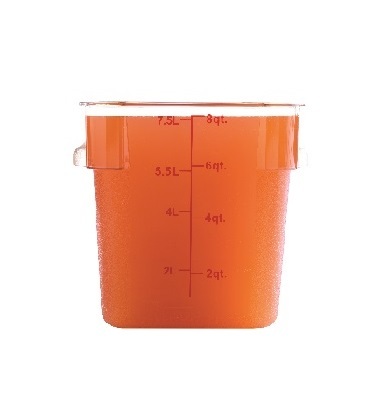 sriracha hot chili sauce	 2 oz. 32 tsp. Mix sweet potatoes, the second measure of olive oil and garlic and the first measure of sriracha sauce. Bake for 10 minutes, or until golden brown. curry powder	 1 oz. 16 tsp. sriracha hot chili sauce	 16 tsp. Mix chick peas, the third measure of olive oil, soy sauce, curry powder and the second measure of sriracha sauce. Bake for 10 minutes, or until golden brown. Mix asparagus and the fourth measure of olive oil. Bake for 12 minutes. 5. In a sauté pan add fifth measure of olive oil, kale, lime juice and chili powder. Cook over medium heat for 5 minutes. 6. To assemble, portion the following into a 20 oz. bowl. #6 scoop, 2/3 cup each broccoli and kale. #10 scoop, 3/8 cup sweet potatoes. # 30 scoop, 1/8 cup each chick peas and asparagus. 7. Garnish with a lemon wedge. Serve immediately. sriracha hot chili sauce	 1.75 oz. 32 tsp. You may decide to build the bowl from a fresh station by following the build in the recipe. You may also decide to complete the bowl as grab and go. You will then build in a grab and go container. Try serving this diah with baked tofu. Red quinoa was used in this recipe but all varieties can be used. For more robust flavor, add additional sriracha.